Have you ever considered what happens when you sign those organ donation forms? If your organs are needed after you die? When Jessica dies, she learns that her organs give the gift of life and tie her to life in unique ways. Jessica isn't happy about the donation nor her death at first; she gradually comes around to learn more about each recipient. The novel is told from the recipients' perspectives as well as Jessica's. I loved how the author developed each character carefully and somehow made the reader care for them. The characters had stand-out personalities. I never had any trouble remembering whose back-story belonged to whom. I loved Jessica's revelations about how she thought that she didn't have an important life and that it was cut too short, but that her life had a huge impact on others. I liked how Kizer handled the subject of organ donation...which is often a touchy one. I think this option still remains a choice, but this is a good book to read for anyone wanting to learn about a possible outcome. The ending was wonderful and this book does not disappoint. 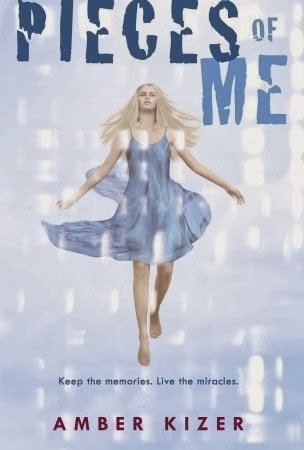 Pieces of Me is perfect for young adult/adult readers. The whole organ donor controversy makes this story sound so interesting. I am excited that it sounds unlike anything I have ever read before and it sounds amazing! I am desperate to read this book because I love the idea of parts of your body living on after you are gone (I saw a movie many years ago about this subject called Body Parts that haunted me for years lol) and also because I read her previous release, A Matter of Days, and absolutely LOVED it. I want and need to read all of her books. Thank you!! I am excited to find out what Jessica will see and feel after other people get pieces of her. Just the thought of still being around, and seeing another person, or more than one person, walking around and living their lives because of your organs, would be a very hard transition. I can't imagine the anger, the jealousy, the pain and the suffering it would cause. But also, the realization that you made that possible, and the change that could create in you if you allowed it. I think this book could truly be something incredibly special, and I would love the chance to read it and see if I am right. Thank you for the chance to wiN! I've read a book kinda like this one and loved it hopefully illl like this one too!!!!! !